However, perhaps the strangest element of the Reagan assassination attempt is the would-be assassin, John Hinkley Jr., who, like Lee Harvey Oswald and Sirhan Sirhan, seemed like a lunatic lone gunman, readymade for daytime television. Like John Lennon’s assassin, Mark David Chapman, Hinkley was interested in the oddball loner novel The Catcher in the Rye and notoriously had an obsessive crush on Jodi Foster. However, the strangest things about John Hinkley Jr. is that his family was close and intimate friends with the family of then Vice President George H.W. Bush—in fact, as the New York Times reported on April 1, 1981, just two days after the assassination attempt, John Hinckley’s brother Scott was scheduled to eat dinner with Vice President Bush’s son Neil the day of the assassination. This strange coincidence, which would be repeated by another strange coincidence, the meeting between George H.W. Bush and Shafiq bin Laden, brother of Osama Bin Laden on September 11, 2001, was only one of very many times in recent American history in which the Bush family happened to be at the wrong place at the wrong time. However, such a conversation is for another place and other time. One person who took a special animosity for the Bush family after the assassination attempt to was none other than Nancy Reagan. 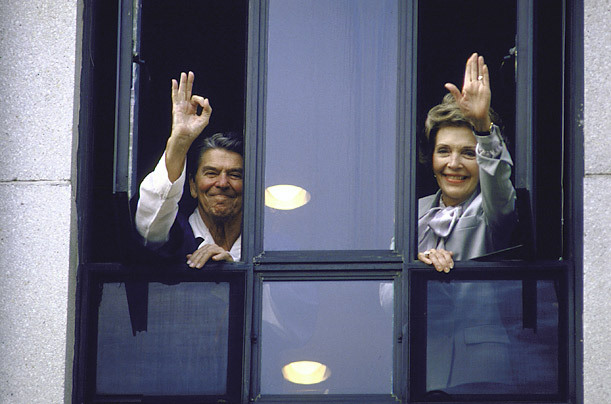 Not only did the First Lady develop a bitter hostility to the Bushes, she also turned to “supernatural” sources for protection from hostile enemies, employing astrologist, Joan Quigley, to help craft her husband, Ronald Reagan’s schedule, making it favorable to astrological and occult influence. This dark secret in the Reagan White House is commonly known among the average American, since former Secretary of the Treasury and White House Chief of Staff, Donald Regan, released these details in his 1988 memoirs For the Record: From Wall Street to Washington. Astrology and its attendant magic is a grave sin. However, such an interest is not especially out of the ordinary--even among First Ladies. Not quite as well known, but nonetheless reported by establishment media outlets such as Salon and the Washington Post, Ronald Reagan himself was devoted to the teaching of occultist and high level Free Mason, P. Manly Hall, whose writings helped to shape not only Reagan’s personal life but his administrative policies as well. In 1944, Hall crafted his vision for a post-World War II America titled, “The Secret Destiny of America.” In this work, the Free Masonic magus argues for a special role for the United States in the creation of a “world democracy,” not unlike the language of an “ancient hope” or “New World Order” of George H.W. and W. Bush. This language is not only nearly identical to that used by the Bush presidencies to sell the War on Terror, but it is consonant-- as Hall himself notes in The Secret Destiny of America-- with the entire liberal project in the United States, which was condemned as “Americanism” by Pope Leo XIII in his 1899 encyclical Testem Benevolentiae Nostrae but later sold to Catholics by Neo-Thomists like Jacques Maritain as well as their intellectual children among the Catholic neoconservatives. In fact, one Catholic neoconservative writer, Paul Kengor, in his 2017 book, A Pope and a President: John Paul II, Ronald Reagan, and the Extraordinary Untold Story of the 20th Century, argues that president Reagan’s belief in the DP or Divine Plan for the United States and liberal democracy to triumph over Soviet Communism was a fulfillment of the triumphant of the Immaculate Heart of Our Lady of Fatima. However, looking at the occult roots of some of Reagan’s thinking in the writings of Manly P. Hall, which were shared by many other presidents and American public figures, it is difficult to say that the DP of Ronald Reagan was the same DP of Our Lady of Fatima. Moreover, the tremendous destruction wrought by Hollywood culture--which has corroded much of the West and is immediately pumped into Christian and Muslim countries after having been liberated by American military forces--is a sign that the Golden Age predicated by Manly P. Hall will not be a period of true freedom and spiritual enlightenment but rather degeneracy, cruelty, and slavery. Is it possible that the DP of American liberalism to bring freedom, enlightenment, and laissez faire capitalism throughout the world indeed has a spiritual source, but one located below the earth as opposed to above it, and the goal of this project is not true Christian freedom but spiritual slavery?